Q66- KSL Gold Tab - where to put thumb? I have just purchased a KSL Gold Tab and with reference to Question 65 I'm a bit confused, as where to put my thumb on the tab The instruction manual shows two pictures with the thumb on top of the shelf, whilst in the answer to Question 65 it states, " The shelf should not be used to rest the thumb on...."
Could you please clarify this apparent contradiction. I agree with you that the pictures shown in the instruction brochure, see here, could give rise to confusion. Unfortunately, K.I.A. was not consulted to comment on this brochure prior to publication. However, be that as it may, it would appear that the prime purpose of these pictures are to show various parts of the tab and not how to hold the tab.Unfortunately, these pictures could give rise to confusion. The comments given in Q65 are correct. In addition, the thumb of the drawing hand should be positioned as shown in the photo below. Here we can see the drawing hand thumb pressed tightely into the sternomastoid muscle of the neck. The pinky is also touching the neck. Both of these reference points can be used when checking for a full and complete loading position. 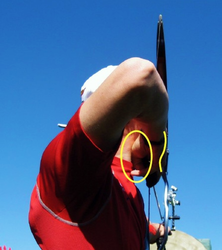 Notcie how the drawing elbow is already fully behind the arrow. Most importantly, notice how the drawing hand wrist is till bent outwards.